Good shot, bad luck and hell are the five basic words to be used in a game of tennis. For almost a century, womens tennis has been a highly visible public arena for strides in social change and gender equality. From its country-club roots to its modern incarnation as a multimillion-dollar industry, womens tennis has been jam-packed with incredible female players. They have changed the standard of dress, desegregated the sport and popularized it so that today womens tennis is more watched than mens tennis. Women first played at Wimbledon, the sports most prestigious tournament, in 1884, seven years after the first mens tournament. Participation in the other Grand Slam tournaments soon followed. Female tennis players also played in the Olympics until the sport was dropped from the roster in 1924 (it was reinstated in 1988). In tennis early days, women competed in long skirts, corsets, full petticoats and stockings, all of which greatly impeded on-court movement. 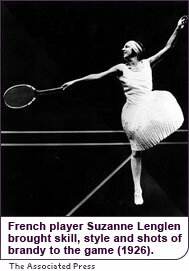 The flamboyant French player Suzanne Lenglen, who dominated the game in the 1920s and was the first professional player, shocked fans when she wore a dress cut just below the knees in her first Wimbledon championship (she won). Known for her wild behavior during matches (including sips of brandy during changeovers), Lenglens flapper attitude and cutting-edge style made the sport far more interesting for spectators. Lenglen was as prominent as baseball star Babe Ruth in the press, and her 1926 match against American Helen Wills garnered nearly as much public attention as the Battle of the Sexes competition did 47 years later. Lenglen, Wills and two other American players, Helen Jacobs and Alice Marble, were the primary female stars of the so-called Golden Era, the time between the two World Wars when tennis first produced recognizable international players. Until the 1950s, matches were segregated, with African American players unable to compete in the sports main championships. Marble used her star power to convince the United States Lawn Tennis Association to let Althea Gibson play in the U.S. Nationals (now known as the U.S. Open). Gibson soon broke the color barrier at Wimbledon as well and went on to win 11 Grand Slam tournaments. While playing some aggressive serve-and-volley tennis, Gibson paved the way for other minorities and helped make tennis the diverse sport it is today. Desegregating the major tourneys was an important moment in tennis, and societal, history. Still, tennis didnt really take off around the globe until the Open Era began in 1968, which allowed professional players to participate in major tournaments. Prior to this move, the traditional tournament circuit was only open to amateur players, although shamateurism (paying players under the table to appear in particular tournaments) was widespread. Billie Jean King was one of the strongest proponents for the change, hoping that the new ruling would give professionals more status within the sport and eliminate some of the sports exclusivity. Indeed, abolishing the distinction between amateurs and pros in major tournaments turned tennis into a big-money sport and made it possible for more women to pursue professional tennis careers. However, there was a huge pay discrepancy between men and women, with as much as an 800 percent difference in prize money. Never one to be second best, Billie Jean King once again led the crusade, boycotting the usual professional circuit and working with other female players to establish their own tour. In 1970 she and eight other players founded the Womens Tennis Association (WTA) and started the Virginia Slims Circuit, the first all-female professional tour. 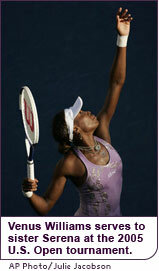 The next year, King became the first female player to cross the six-figure earning mark in U.S. dollars. By the early 1980s, Czech-born star Martina Navratilova earned more than one million U.S. dollars in a season. On the heels of these major changes came revolutionary equipment developments. The introduction of lighter metal frames (replacing wooden models) in 1967 and the oversized racket head in 1976 changed playing styles. The game became faster, with service speeds climbing above the 100 miles (160.9 kilometers) per hour mark. Bigger, stronger, fasterand youngerplayers were needed to keep up with the hardwares capabilities. 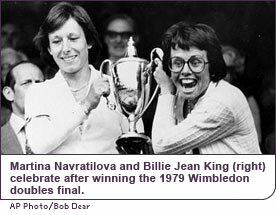 During the 1970s and 80s, new players emerged such as Czech Martina Navratilova and American Chris Evert. Television broadcasts increased the stars public stature, and the rivalry between the two top players was incredibly dramatic. For almost 12 years, the two players traded the number-one ranking in the world. 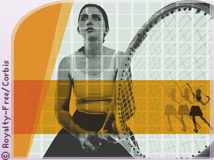 By the turn of the millennium, the WTA tour featured 63 sanctioned, globe-spanning events. Annual prize money rose to US$50 million, and many players picked up endorsement deals alongside their winnings. With the sport fully established, another sea change came in the form of two sisters from Compton, California: Venus and Serena Williams. With cornrows and colorful outfits of their own design, the Williams sisters brought new life to a sport once considered stodgy, sissy and upper-crust. The sport became popular with new, younger fans and further opened the courts for African American players. And the Williams sisters had the game to back up their hype: Venus set the record for fastest serve at 127 miles (204.3 kilometers) per hour, whereas Serena set the record for highest earnings of a female player. 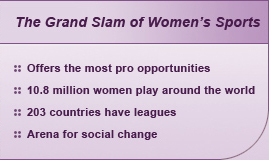 Although womens Grand Slam tennis differs from the men in match play (men play best of five sets, women play best of three), the levels of play are now comparable in power, agility and attitude. Greatly aided by their predecessors, todays tennis stars earn monies comparable, albeit not always equal, to their male counterparts. The example set by womens tennis helped blaze paths for other professional sports leagues, including basketball (e.g., U.S. WNBA) and soccer (e.g., U.S. WUSA) leagues.